A file folder game is a simple way to make a game for fun or for learning a concept. 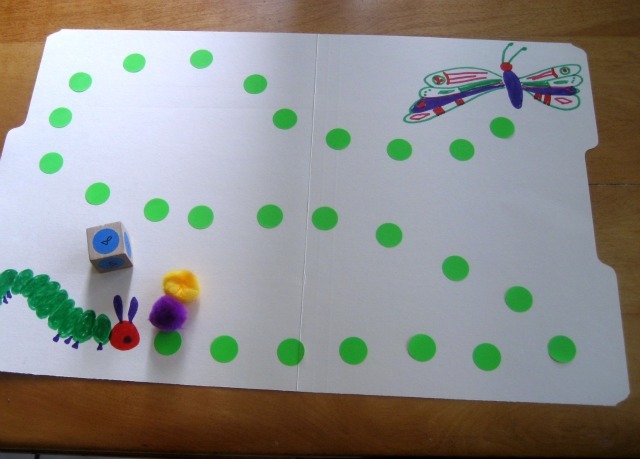 This cute caterpillar game is a great way to work on math or language skills while also reinforcing the concept of a caterpillar metamorphosis into a butterfly. We at Kids Activities Blog hope that you come up with some fun ways to make your own file folder games for your kids. Have fun! 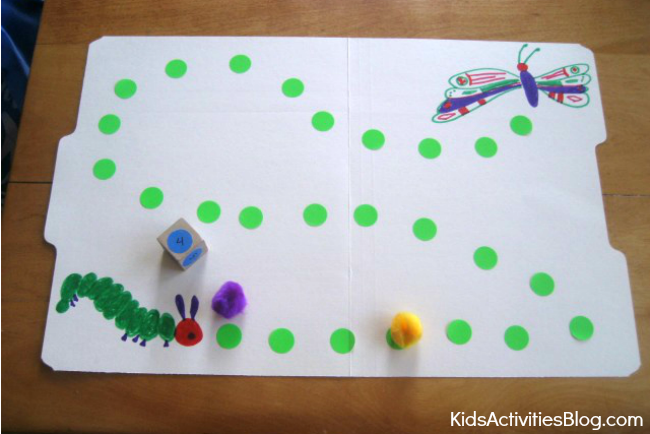 A file folder game like this caterpillar game are one of my favorite learning tools to make. They easily fit any theme your children are interested in or that you will be studying. We have just had caterpillars delivered to our house so, I created a file folder game with caterpillar to butterfly theme. I also love that file folder games fold up easily and can be stored in a file box or cabinet. They travel well on car trips or from your kitchen to a shady tree in your backyard. They are so reasonable to make. My favorite part about file folder games made of paths of dots is that they can be used to practice or assess understanding of a lot of concepts. Math concepts, language skills, science vocabulary or social studies facts can all be done with a file folder game. My son has been working on speaking specific letters sounds clearly that give him a challenge. We have used the caterpillar game to review those sounds. After every four or five words containing those sounds that he says correctly, he gets to roll the die. He then gets to hop the pom pom of his choice forward the number that comes up on the die. Since I have also been clearly saying those letter sounds, I get too roll the die and move forward the unchosen pom pom. Practicing sounds while competing to get to the butterfly at the end of the path had really helped him focus on saying his letter sounds correctly. He really wants to win and he really wants me not to win. A simple file folder game has become a motivator to successfully work on a particular skill that needs to be worked on. I bet you have a skill or two that need to be worked on by your children. It may not be an oral skill like a letter sounds or reciting a fact. You might need to work on writing numbers or letters. It may be larger motor skill or a small motor one. Simply getting the reward of moving down the path on file folder game may be just what they need to inspire them to work on that skill. I think we will be making more and more file folder games at our house. What a great idea! This would also make a fun activity to go along with “The Hungry Caterpillar” by Eric Carle.